Can trade liberalization and environmental protection be pursued together, or do the two objectives inevitably conflict? The rapid evolution of international regimes and institutions is increasingly bringing such conflicts to the fore. A consensus, both on the extent of the clash, and on how it can be resolved, does not yet exist. 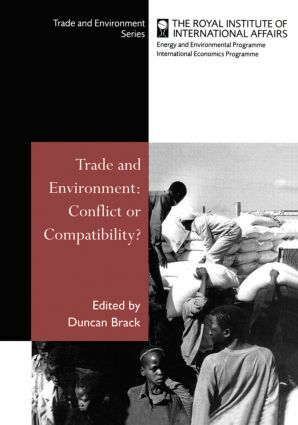 This volume includes the proceedings from the RIIA's April 1997 conference on trade and the environment, which brought together prominent contributors from all sides of the debate, including industry, governments, academics, NG0s and intergovernmental institutions such as the World Trade Organization, UNEP, UNCTAD and the OECD. They examine the background to the issue; the impacts of trade-related environmental measures; the relationship between environmental policy, competitiveness and investment; industry and developing country concerns; and the evolution of dispute settlement procedures in the EU and the WTO. The concluding chapter features a wide-ranging discussion on the future of the debate and of the WTO's Committee on Trade and Environment.